January 3rd 1888; the refracting telescope at the Lick Observatory, measuring 91 cm in diameter, is used for the first time. It was the largest telescope in the world at the time. The Lick Observatory is an astronomical observatory, owned and operated by the University of California. It is situated on the summit of Mount Hamilton, in the Diablo Range just east of San Jose, California, USA. The observatory is managed from the University of California, Santa Cruz, where its scientific staff moved in the mid-1960s. Lick Observatory was the world's first permanently occupied mountain-top observatory. The observatory, in a Classical Revival style structure, was constructed between 1876 and 1887, from a bequest from James Lick. In 1887 Lick's body was buried under the future site of the telescope, with a brass tablet bearing the inscription, "Here lies the body of James Lick". Before construction could begin, a road to the site had to be built. All of the construction materials had to be brought to the site by horse and mule-drawn wagons, which could not negotiate a steep grade. To keep the grade below 6.5%, the road had to take a very winding and sinuous path, which the modern-day road (SR 130) still follows. Tradition maintains that this road has exactly 365 turns. (This is approximately correct, although uncertainty as to what should count as a turn makes precise verification impossible). Even those who do not normally suffer from motion-sickness find the road challenging. The road is closed when there is snow at Lick Observatory. The 36 inch (91.44-cm) refracting telescope on Mt. Hamilton was Earth's largest refracting telescope during the period from when it saw first light on January 3, 1888, until the construction of Yerkes in 1897. Warner & Swasey designed and built the telescope, with the 36-inch lens done by Alvan Clark & Sons. 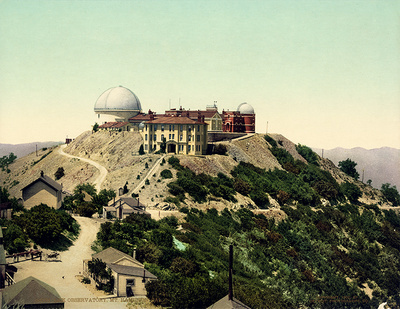 In May, 1888, the observatory was turned over to the Regents of the University of California, and it became the first permanently occupied mountain-top observatory in the world. Edward Singleton Holden was the first director. The location provided excellent viewing performance due to lack of ambient light and pollution; additionally, the night air at the top of Mt. Hamilton is extremely calm, and the mountain peak is normally above the level of the low cloud cover that is often seen in the San Jose area. When low cloud cover is present below the peak, light pollution is cut to almost nothing. On May 21, 1939, during a nighttime fog that engulfed the summit, a two-seater attack plane crashed into the main building. Due to a scientific meeting being held elsewhere, the only staff member present was Nicholas Mayall. Fortunately, nothing caught fire and the two individuals in the building were unharmed. The telephone line was broken by the crash, so no help could be called for at first. Eventually help arrived together with numerous reporters and photographers, who kept arriving almost all night long. Evidence of their numbers could be seen the next day by the litter of flash bulbs carpeting the parking lot. The press widely covered the accident and many reports emphasized the luck in not losing a large cabinet of spectrograms which was knocked over by the crash coming through an astronomer's office window. Perhaps more notable was the lack of fire nor damage to the 36-inch (0.91 m) Crossley reflector dome. With the growth of San Jose, and the rest of Silicon Valley, light pollution became a problem for the observatory. In the 1970s, a site in the Santa Lucia Mountains at Junípero Serra Peak, southeast of Monterey, was evaluated for possible relocation of many of the telescopes. However, funding for the move was not available, and in 1980 San Jose began a program to reduce the effects of lighting, most notably replacing all streetlamps with low pressure sodium lamps. The result is that the Mount Hamilton site remains a viable location for a major working observatory. Asteroid 6216 San Jose was named in honor of the city's efforts to reduce light pollution by the International Astronomical Union. In 2006, there were 23 families in residence, plus typically between two to ten visiting astronomers from the University of California campuses, who stay in dormitories while working at the observatory. The little town of Mount Hamilton atop the mountain has its own police and a post office, and until recently a one-room schoolhouse. In 2008, there were 38 people residing on the mountain; the chef and commons dinner were decommissioned earlier in the year.